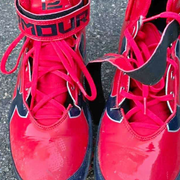 Thread: Tom Brady Game Worn Cleats? I purchased these recently. 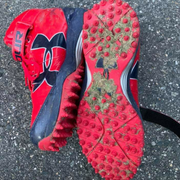 Trying to find a potential photo match, or anyone with info on a pair of TB12 Under Armour Cleats. Any info appreciated. Any suggestions on high res photos as well, I believe these are from the 2018 season but do not know for sure. I owned these cleats shortly after your posting here. When I got them, I tried to photo match but had no luck. Unfortunately had to return them. He used turf shoes on a grass field in only one game and that was in Jacksonville. I have checked them against those images and they do not seem to match. If I'm not mistaken- he also used them pre season vs the Panthers. Hey, thanks for posting. You bought these?? I did. I owned them for all of 8 hours and packed them back up and mailed them off. Small world! Was that you that bought them from me at a Sportsworld?